Visiting the Lofoten and Vesteralen islands is a real escape. Warmed by the Gulf Stream, these Arctic islands – perhaps the most famous in mainland Norway – have huge contrasts, but are equals for wildlife and scenery. This is island-hopping with a difference. This collection of islands off the northwest coast of Norway are a unique combination of sheer jagged mountain peaks, tranquil villages with colourful rorbuer (converted fishermen’s cottages) and white sandy beaches. At 68 degrees, high above the Arctic Circle, the Lofoten enjoy long summer days and thanks to the Gulf Stream, mild and comfortable temperatures. From the end of May to mid July the sun never dips below the horizon, meaning long days to soak up the scenery. Driving here is a pure pleasure with little traffic, amazing scenery and excellent road conditions, with some impressive bridges now connecting most of the islands. 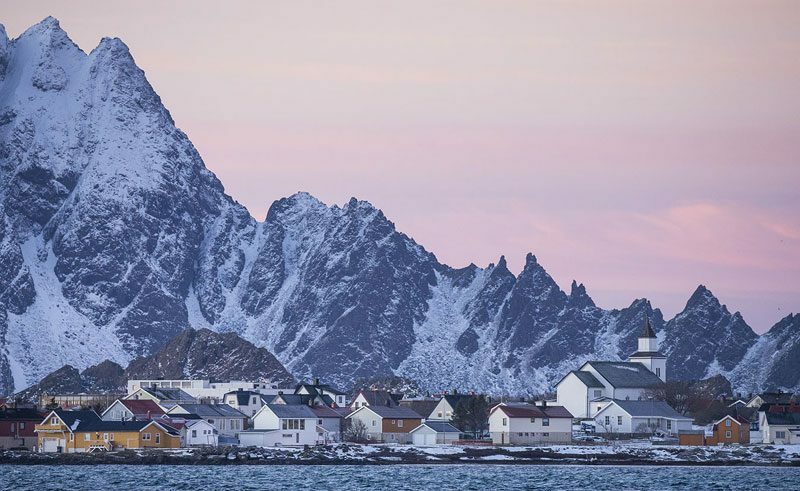 A stop in many of the colourful fishing villages is a must: Svolvaer; Henningsvaer; Nusfjord; Reine and finally at the shortest-named village – A (pronounced ‘or’), where both the road and the Lofotenveggen end. For those with the aurora in mind, between late august and early april, it is possible to see the northern lights from the Lofoten Islands. A car ferry north from Fiskebol to Melbu connects Lofoten to this second island group. Dominated by the fishing industry, Vesteralen is greener and gentler than their neighbours. Though the scenery and villages are less impressive than those of Lofoten, one definite highlight of this archipelago is the majestic and extremely narrow Trollfjord. Only 100m wide at its mouth, this bare slither of water cuts into the towering rock face for 2km, requiring some careful manoeuvring by the boats that visit. On the island of Langoya drive around the foot of Mount Reka to the rugged western side of the island, and you’ll find an excellent area for spotting many species of birds – sea eagle, puffin and razorbill to name a few. Whale watching trips operate from Andenes at the northern tip of Andoyoa – sperm whales return each year and there is good chance of seeing other species such as minke, orca and humpback. The gateway to the islands of Lofoten and Vesteralen, the port of Narvik is not going to win any beauty awards but it does have a lively atmosphere. The primary port for distribution of the iron ore mine in Kiruna, Sweden, Narvik now has road access to the Lofoten Islands via the addition of a road bridge. A rocky pinnacle rising from the soft blues of the Atlantic, the island of Bleiksoya plays host to around 80 000 pairs of puffins, guillemots, gulls a variety of other sea birds. Andenes, situated on the North Vesteralen Islands is one of the most reliable places to spot whales off the coast of Norway with a 95-99% success rate. There are several excursions in Svolvaer which can be pre-booked. 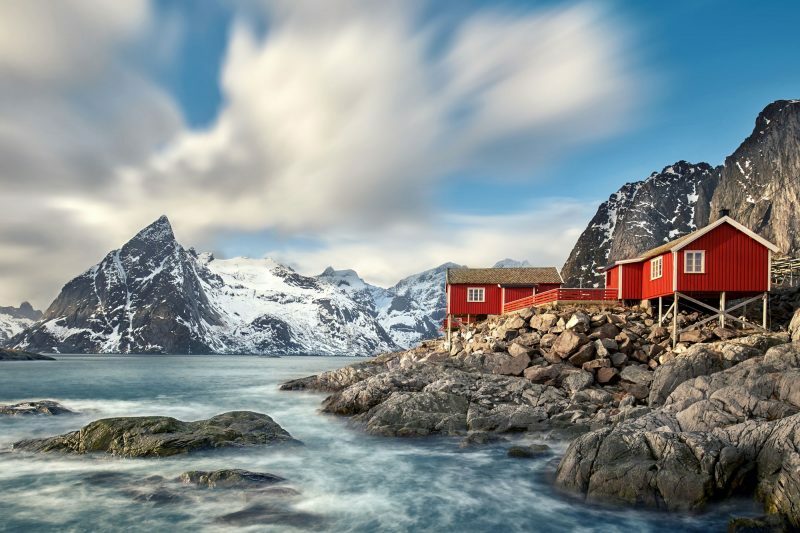 In the western part of Lofoten lies the fishing village of Reine, where there are many opportunities for all kinds of outdoor activities. Lovely lodge accommodation in a spectacular coastal setting.